Sikkim, cradled amidst snow clad mountain peaks is one of the most ideal destinations for the trekkers and adventure enthusiasts. In the southwestern part of Sikkim, in the main Himalayan range, lies the majestic Khangchendzonga or Kanchenjunga, standing tall with a height of 8,585 m (28,169 ft) above sea level. In addition to Kanchenjunga, there are several other mountain peaks which offers some good mountaineering opportunities. Mountaineering expeditions, unlike trekking, require more planning and paperwork as clearance is required from Ladian Mountaineering Foundation, New Delhi. Local Government also imposes royalty on some peaks. The first European to explore the Kanchenjungha area was Douglas W. Fresfield who reached its base in 1899 from the Green Lake Basin area. In 1977 another expedition led by Major Prem Chand reached a few feets below the summit. In 1987, an Assam Rifles expedition attempted the peak. In 1991 an Indo Japanese expedition led by Hukam Singh and Yoshio Ogata conquered the peak. The Kabru was first climbed in 1935 by a British C. R. Cooke. The Pyramid Peak was first conquered in 1949 by a Swiss R. Dittert. A British A. M. Kallas, climbed the Paunhri in 1911. The summit of Siniolchu was first reached by a German in 1936. It was later again climbed by the famous Sikkimese Everester Sonam Gyatso. 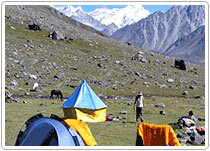 Pandim was climbed in 1993 by a team from the Sonam Gyatso Mountaineering Institute. Rathong was conquered by an Indian expedition in 1964. Beautiful snow clad mountains present myriad challenges for the mountaineers but cannot stop these enthusiasts from exploring themselves. Major Mountaineering Peaks in Sikkim : Kanchenjunga, Kabru, Kirat Chulior Tent Peak (7,365 m) and Sinolchu (6,887 m). Equipment Required: Plastic boots and Crampons with front Points, Mountaineering harness, mountaineering ice-axe, climbing sling and two locking carabiners, telescopic ski-sticks, Prussik loops, Climbing helmet are some of the essential equipment needed for mountaineering. Equipment can be hired, either from clubs, or purchased from one of the agencies selling it. Prior to setting out, all equipment must be tested, and team members must familiarize themselves with its use. The Sikkim Himalayas, the epitome of the world's mountains, encompass a wonderland, which for sheer beauty and magnificence remains unbeaten elsewhere in the globe. In the southwestern part of Sikkim, in the main Himalayan range, lies the majestic Kanchendzonga or Kanchenjunga, rising to a staggering height of 8,585 m (28,169 ft) above sea level. Beside this third largest peaks, other famous mountaineering peaks in Sikkim include - Kabru, Kirat Chulior Tent Peak (7,365 m) and Sinolchu (6,887 m).